Scientists at Oxford University have isolated a gene they believe contributes to obesity. Known as the FTO, it could lead to drugs designed to help people control their weight. One in three adults in the United States and one in four in the United Kingdom is obese. It's the main cause of heart disease, type 2 diabetes and cancer and has been described as a greater danger than smoking, alcohol and poverty. Research by scientists from Oxford University and the University of Exeter in Britain into the genetic origins of disease, funded by the Wellcome Trust and published Friday in Science, led to the discovery of the FTO gene. The sample involved in the study was impressively large. It began with research not into obesity but into the genetic origins of disease. For this research, the genomes of 2,000 people with type 2 diabetes were compared with the genomes of 3,000 healthy individuals. They established that particular versions of FTO appeared more frequently among people with type 2 diabetes. When they reformulated the data to look at obesity, the effect disappeared. Curious as to whether FTO had an influence upon obesity, they tested their hypothesis on a vastly increased sample of 37,000 people. There are two varieties of FTO, and everybody inherits two copies of the gene. But depending on which variety, you are more likely or less likely to become obese. The scientists established that 16 percent of people had the weakest genetic composition. They were found to have two copies of the high-risk version and to carry an average of 7 pounds excess weight, with 15 percent more body fat. 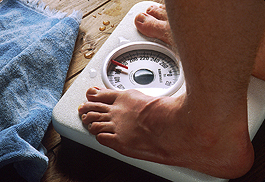 This percentage, one in six people, has a 70-percent greater risk of becoming obese. Fifty percent of people are likely to carry one high-risk copy and one low-risk, putting them at a 30-percent greater vulnerability of developing obesity. These people weigh an average of 3 pounds extra. With the lowest danger of becoming obese are the 34 percent of people who have two low-risk copies. The extra weight in each case was found to come neither from greater height nor from developed muscle but exclusively from extra body fat. The scientists point out that FTO is not the only gene that will have an impact on obesity. Nor does inheriting a variant of the gene automatically mean that a person will become overweight. 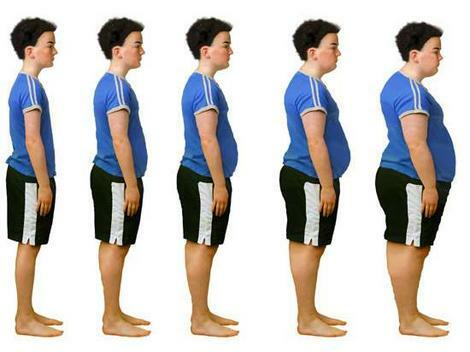 It should be regarded only as one gene that contributes to the risk of obesity. This news will come as a relief to people who pay attention to their diet -- and who cannot understand with their eating and exercise habits why they should be carrying extra weight -- that their genes may be responsible. It will probably give greater strength to the complaint from others that, "It's not me, doctor, it's my metabolism." But genes cannot be held entirely to blame. Just look at the figures cited by the researchers. They describe extra weight as a handful of pounds. There is a massive -- the word is deliberately chosen -- difference between 7 pounds excess weight and 20, 50 and 100-plus pounds excess weight. At some point, food habits and exercise must also be factored in. It would be a mistake for anyone carrying more body fat than they should to persist in their present poor habits while waiting for some drug to come along that will magically make them thin and healthy. So in this spring season when there's no reason to bypass the produce aisles and head for the ready-made food shelves in the supermarket, think green. First go for a run over the fresh grass in your local park or neighborhood. Exercise has a strange way of diminishing your appetite. Out shopping, grab bunches of vegetables that are in their infancy, like broccolini, the smallest french beans, snow peas and more, and steam them just until they've lost their stiffness and still have a bit of crunch. Then toss them in a glug of excellent olive oil and sprinkle with a pinch of sea salt and freshly ground black pepper. For the protein, per serving lay two slices of prosciutto ham, then a 4-ounce fillet of firm white fish on a piece of greaseproof paper large enough to wrap around and enclose it. Put a couple of fresh springs of tarragon on top and two or three thin slices of lemon on that, season to taste, then bring any of the ham round and over the fillet, fold up the paper tightly to close, then microwave for 4 minutes for a 1-inch thick fillet, or until opaque. Serve on top of a mixed mound of the steamed vegetables and relish the flavor and the start of a new way of life.